Sunday October 29 1911 I got the dinner that all seemed to enjoy. LeGrand went to Cedar Rapids in the afternoon. Hattie came out in the afternoon It cheered me up some to have them come I read all evening Monday October 30 1911 It was snowing so I could not wash. I wrote to Mr Wyman about the [Deloran?] property and a letter to By & Millie and did the forenoon work. I sewed some in the afternoon. Tuesday October 31 1911 Will & I washed five quilts in the morning. I was in town all afternoon. Come home at 4.30. Sister Ida got on the car she had come from Chicago. After supper she went down to Otts to stay the night. Weather very cold tonight. 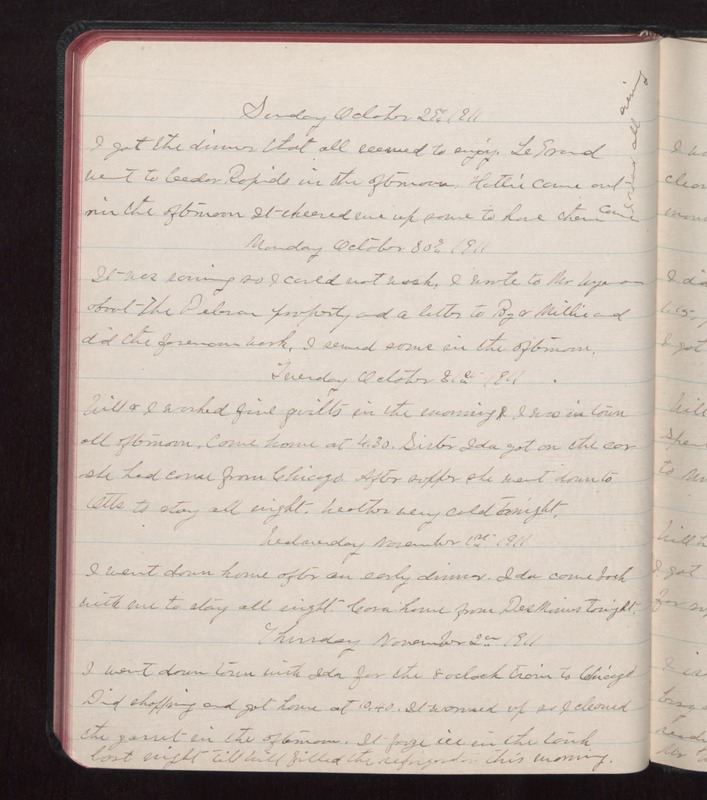 Wednesday November 1st 1911 I went down home after an early dinner. Ida came back with me to stay all night. Cora home from Des Moines tonight. Thursday November 2 1911 I went down town with Ida for the 8 oclock train to Chicago. Did shopping and got home at 10.40. It warmed up so I cleaned the garret in the afternoon. It froze ice in the tank last night till Will filled the refrigerator this morning.